Check options online. With fuel prices at a multiyear peak, it’s time to get to know the various apps that map area gas stations and current pump prices. GasBuddy, Fuel Finder, Gas Guru, and AAA all can point you to the lowest price around, which can be valuable at a time when the price increases are costing drivers $100 to $200 more a year. Plan ahead. Gasoline taxes differ significantly from state to state, so if your road trip crosses a state line, plan accordingly. A driver leaving Ohio and entering Pennsylvania, for example, would have to pay 36 cents per gallon more to refuel after crossing the border. You should also try to avoid stations on major highways, because they tend to charge more. Who says the U.S. Postal Service can’t innovate? On June 20, the service is rolling out its first-ever scratch-and-sniff postage stamps. 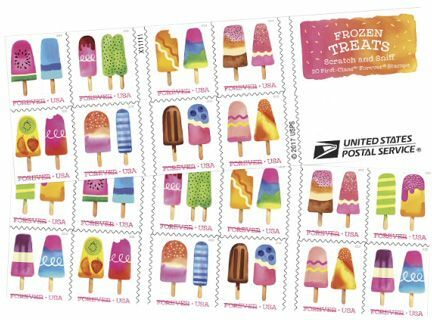 Perfect for birthday cards or summer party invitations, Frozen Treats First-Class Forever Stamps depict a variety of colorful popsicles painted in watercolor by illustrator Margaret Berg. Start scratching and you’ll smell kiwi, watermelon, strawberry, root beer, and many other flavors. The series arrives a year after the postal service released Total Eclipse of the Sun, a series of stamps whose thermochromic ink reacts to the heat of your touch. At this rate, snail mail might just make a comeback.